Even if you are familiar with sending holiday eCards, the following tips will help make the process less labor intensive and hopefully even better received by your eCard recipients. When selecting a holiday card design, you can choose one of CorpNote's eCard designs or upload your own photo or artwork. Either way, you have the ability to customize the text that appears below your eCard image and the signature information such as your company logo, name, contact info and social media links. One of the reasons people choose CorpNote is that you can upload your own artwork or photos to use as the image in your holiday eCards. You can do this with photos from your cellphone or almost any graphics software program. How to Make an eCard. We've included lots of examples and helpful tips using a variety of software, including software you can use on mobile devices. Create Your own eCard Designs from Photos or Graphic Art. This step-by-step tutorial covers how to create, upload and manage your custom eCard designs. Many articles have been written on how to create the right sentiment in a greeting card. We have found the best way to create the perfect holiday message is to look at other greeting cards you receive or even sentiments you see in ads or shopping sites can serve as inspiration. This can actually be done any time of year. Take the best ideas, formulate your own unique messages and add them to our message helper so they are readily available to you when you go to create your greeting cards. You can also pre-format your custom messages with color, size, bolding, lists and hyperlinked text to further engage your audience. Still not sure what to say? Our message helper makes composing your holiday greetings fast and easy. When composing your eCard message, just click on the message helper button to find a variety of pre-formatted stock messages which you can easily insert into your eCards. You can then edit the message to make it perfectly suit your intended audience. Most everyone knows that holiday eCards are more economical, but eCards also engage your audience in a more immersive experience than print. If your company has an online video, you can include a link to your video in your eCard. For example, one of our members created a video of their employees doing volunteer work and how much money they raised. They posted the video on YouTube and then added a link to it in their holiday eCard message. 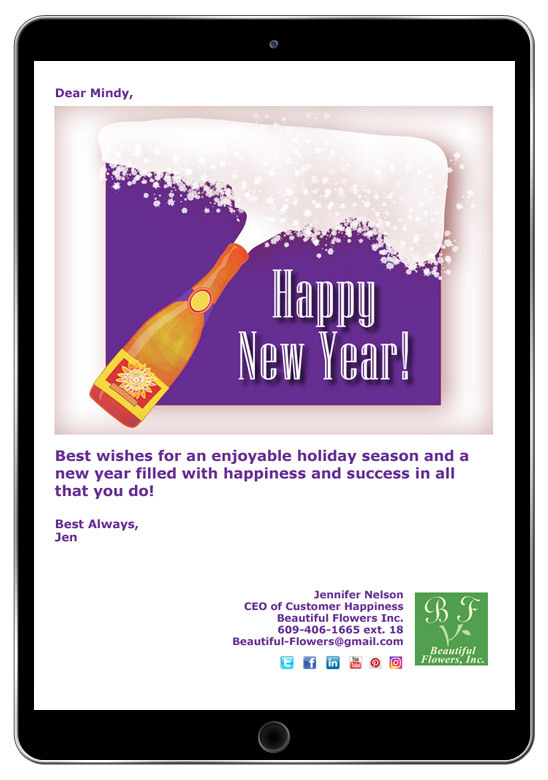 The eCard signature is an important element to include in your holiday eCard to encourage interaction with your company. We recommend that you add all of your contact information when setting up your account such as your street address, website address and social media links. You will have the opportunity, on each individual eCard, to easily select what contact information you want to display (or not display). So for a business holiday eCard, you might want to include all of the fields, but for an eCard to your nephew, you might want to omit the signature entirely. Important Tip: The first name and last name you set for your signature is also what appears as the 'From' text in your recipients inbox. See how this makes a different when you review the next section below which contains information on effective subject lines. After you create your holiday eCards, you can send your them immediately or schedule your send date. When is the best time to send your holiday eCards? Statistically, sending emails on a Tuesday tends to result in higher email open rates. But, when its holiday time and you're sending holiday eCards, all bets are off. For example, you may want to avoid sending during peak email times like Black Friday through Cyber Monday because your email has a higher chance of getting ignored in someone's overwhelmed inbox. However, you may find that sending your email on a Tuesday two weeks before Christmas works well for you. If this is your first year figuring out which send date gives you the best open rate, then we recommend sending your holiday eCards in smaller batches. Keep a record of when you achieved the highest open rate and use that as a guide for next year's holiday eCard campaign. It is important to create a strong subject line to ensure that your holiday eCard recipients will recognize the email and be prompted to open it. If you combine a good subject line with a high quality permission-based email list, you have the best chance for a higher email open rate. The subject line and first sentence of your eCard are the most important as most phones and email programs provide the first 50 characters of the subject line and sometimes a preview of the first few sentences of the email. The recipient can then quickly determine if the email is worth opening. Resist the urge to create long subject lines and keep them below 50 characters. Fine tune your subject line until you say the most with the absolute least amount of words. Say your subject line out load. Do you stumble over the words or does it read well? The first name and last name you set for your CorpNote signature is what appears as the 'From' text in your recipients inbox. Make sure you use a first and last name your contacts will recognize. This will help them immediately identify that the email is from you or your brand and they will be more willing to open the email. CorpNote enables you to send an eCard to 2,500 recipients at a time. It's easy! Use the CorpNote address book to create 'groups' of contacts before you send your holiday eCards. For example, you may want to create groups for employees, customers, vendors, friends etc. and then send a different eCard design and/or message to each group of contacts. 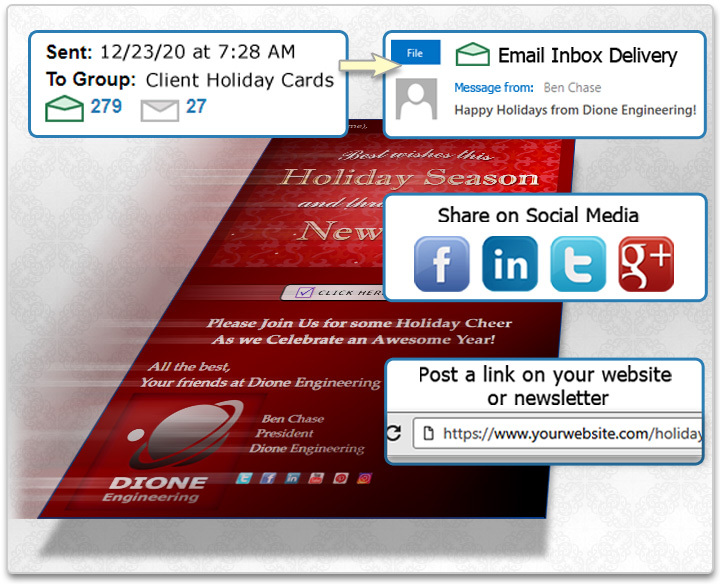 You can use CorpNote's 'Direct Link' feature for creating a link to your holiday eCard on your website or in social media. Send the eCard to yourself, and then go to your 'Sent eCards' bin. Each eCard you send has a 'Copy Link' button which provides the website address for that specific eCard. Another way to share your eCards in social media is to use the 'Share' button next to any sent eCard. This works for Facebook, LinkedIn and Twitter. With traditional printed holiday greeting cards, you don't always know if or when the card has been received. A printed card also doesn't encourage the recipient to respond. This is an area where holiday eCards really shine. Depending on the method you have chosen to send your eCard, you have different ways that you can track your eCard views and your recipients can respond. For more information, view our tutorial on how to track your eCards. If you have shared your eCard on your website or in social media, you will want to make sure you have included your website address and social media links in your eCard signature so your audience can contact you. You may also want to consider furthering engaging them by including a specific link within the message of your eCard. If you have sent your eCard through CorpNote, your recipient can quickly and easily respond by clicking 'reply' to the email since your email address is always the "sent from" email address. They can also click any of the links you have included in your eCard or your eCard signature to respond to you. Creating eCard templates is an important time saving technique when setting up eCards for different occasions. 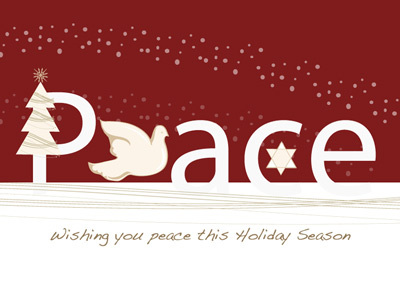 Templates let you save a "send-ready" holiday eCard complete with your greeting card image, message and signature. You can then quickly access a holiday eCard template, address it and send it in less than 30 seconds. You can even edit the information in an eCard template before you send it, which gives you the ultimate flexibility. eCards can only be created from sent eCards. If you create a template from an eCard you have sent to yourself, this will help ensure that you have proofread it and have seen the eCard as your recipient will see it in their email inbox. Important Note: once you send an eCard, you can't change it! Templates let you edit without overwriting your original. For example, when you select an eCard template, you can then modify that templates card image, your message and signature options without affecting your original template. 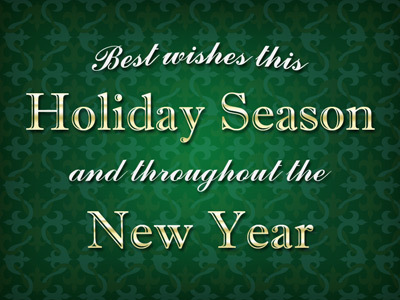 You can set up a recurring eCard series so that your holiday eCards are sent automatically year after year. All you have to do each year is maintain the contacts in your address book. You can also create multiple holiday recurring eCard campaigns. For instance, you may have two recurring holiday eCard campaigns – one for employees and one for customers. There are lots of face-to-face networking opportunities during the holidays, so it's important to be prepared to send a quick follow up eCard. Set up your QuickSend eCard templates in advance and then when the opportunity to send a "holiday eCard" or a holiday themed "thank you" comes up, you've got an eCard ready to go. If you've just met a contact and you send them a QuickSend eCard, you can then automatically import their name and email address into your CorpNote address book.